25x13x21 cm. 25 cm long (10 inches). Made from cold cast bronze and polished to give a beautiful patina very similar to hot cast bronze. Part of the Leonardo range of wild animal figurines, these ornaments are finely detailed and well made. Nicely boxed. 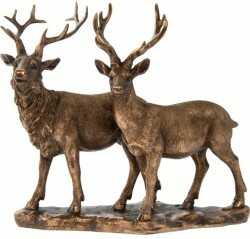 From the Leonardo Collection renowned for their high quality animal sculptures.